The curacao alcoholate is obtained from the double distillation of sweet and bitter oranges. The fruit liqueur maker then steps in to give its finesse and mellowness to the Curacao liqueur by means of subtle blending. Curacao Liqueur, evocative of the island of the same name, is an irreplaceable base for a number of cocktails due to its acidulous orange taste and its bright variable colours. 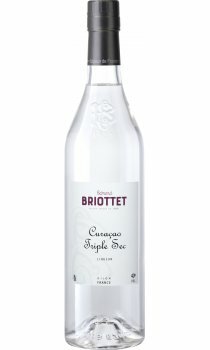 Curacao Triple Sec can also be served with desserts (pancakes), incorporated into various recipes using oranges (duck), or served pure and iced (with a zest of lemon).